DC’s Justice League line is getting a major rehaul after the events of Dark Nights: Metal, and writer Scott Snyder is leading the charge with a new Justice League #1, which introduces a new team and features the return of artist Jim Cheung to DC Comics after years at Marvel. 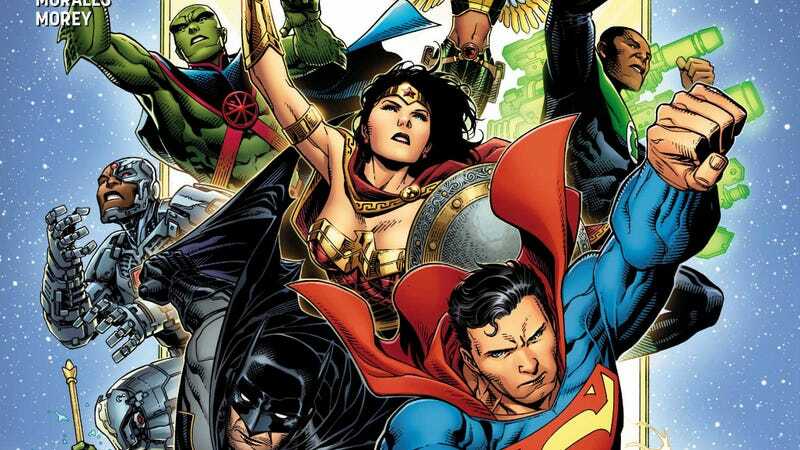 Metal was one of the most exhilarating superhero events in recent memory, and the Justice League relaunch taps into that energy with a sprawling story that travels to all corners of the DC Universe. For the first time ever, the comic-book team features the full roster of the classic Justice League cartoon, with Martian Manhunter, Hawkgirl, and John Stewart’s Green Lantern joining their superhero comrades to fight a mix of new and familiar threats. This collaboration has been the most rewarding aspect of the process for Cheung, and this exclusive preview of this week’s Justice League #1 spotlights how well Cheung works with Snyder, inker Mark Morales, and colorist Tomeu Morey. These pages are stunning, and this creative team’s enthusiasm comes through in the vibrant, lively visuals. That first page teases the massive scope of the story with unexpected faces like the DC One Million characters and Kamandi, and Cheung’s talent for powerful superhero imagery shines in the two-page introduction of the Justice League members.